Panning was the oldest and simplest way to separate gold from surrounding rock. It was the most basic method to obtain placer gold. The basic procedure was to place some gold-bearing materials, such as river gravel, into a shallow pan, add some water, and then carefully swirl the mixture around so the water and light material spilled over the side. If all went well, the heavier gold nuggets or gold dust would settle to the bottom of the pan. 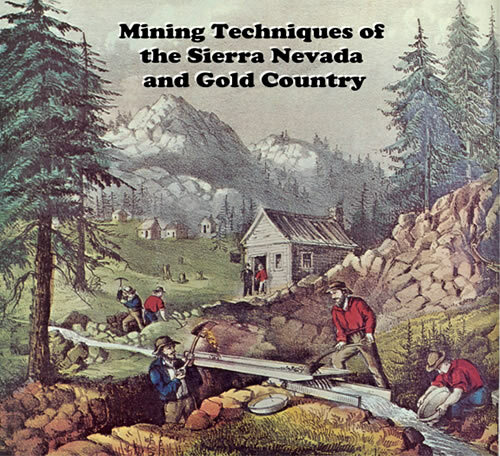 Gold panning techniques are centuries old, but Isaac Humphrey is credited with introducing gold panning at Coloma in 1848. However, the Mexicans may have beaten Humphrey to the punch as they also had developed the skills in their own country, using a flat dish called a batea. Gold panning was slow even for the most skillful miner. On a good day, one miner could wash about 50 pans in the usual 12-hour workday and obtain a small amount of gold dust. Isaac Humphrey is said to have introduced the rocker, or cradle, to the California gold fields as well. A rocker was simply a rectangular wooden box, set at a downward angle and mounted on a rocking mechanism, usually like the rockers on a rocking chair. At the top was a sieve, and at the bottom was a series of cleats, or “riffles.” The dirt and rock was dumped into the top, followed by a bucket of water. The cradle was rocked by hand to agitate the mixture. The big rocks were caught in the sieve, the waste exited the lower end with the water, and the heavy gold fell to the bottom of the box and was caught on the riffles. …Mercury has a facility to trap fine gold. Some miners added small amounts of Mercury to the bottom of the rocker. Due to its chemical composition, Mercury has a facility to trap fine gold. Periodically, the miners would remove the Mercury and heat it; as the mercury vaporized, it would leave free gold as a residue. Operating the Long Tom required several miners. At least two men shoveled dirt, rocks, and gravel into the top of the Long Tom. The third member in the crew threw out the bigger rocks as the material moved along the box. Twice daily, the gold and sand caught on the riffles would be removed and panned. The disadvantage of The Long Tom was that it needed a continuous source of fast-moving water. That required that the Long Tom be located on a riverbank or that ditches must be constructed to deliver water to the mining site. The first mining ditches in Gold Country were most likely built to supply Long Toms. Sluice boxes were extended versions of the Long Tom. A number of sluice boxes were frequently connected into a long line, and large crews of miners were utilized. Ground sluicing was a variant of this practice. Rivers would be diverted into ditches and would soften the gold-bearing dirt and rock. The miners would loosen the dirt and rocks with picks and allow water and gravity to transport the material down to a sluice box. As with the Long Tom, gold was finally removed from the sluice boxes by panning. Hydraulic mining was a potentially efficient method of getting gold out of the ground, but it was also the most environmentally destructive. The principle was very simple but devastating — water under pressure would be directed against a bank of gravel deposits and the hillside would wash away rapidly. The debris would wash into a series of huge sluice boxes that would catch the gold. The first use of this method is credited to Edward Mattison in 1853. Hydraulic mining was a variation on ground sluicing where the water delivered to the site would be shot through a nozzle at high pressure onto the face of the cliff, thereby washing away tons of boulders, gravel, dirt, and gold. The first use of this method is credited to Edward Mattison in 1853. Mattison delivered the water through a rawhide hose to a nozzle he carved out of wood. Later miners upgraded their hoses to metal or the more desirable canvas, and the nozzle soon became iron. Technological advances made the hose and nozzle connections more flexible and allowed greater movement. Lavish attention was paid to the design and specifications of the nozzle and companies began producing their competing appliances. The product names were various — Hoskin’s Dictator and Hoskin’s Little Giant are examples. But the name that stuck was the product name of the Craig Company — the Monitor. The Monitors were powerful to say the least. When the water reached the Monitor it was compressed into a nozzle. The nozzle was from one inch to eight inches in diameter. The stream of water that could wash down whole hillsides was impressive to behold. In his multi-volume 1874 - 1890 classic History of California, the historian Hubert Howe Bancroft stated that an eight-inch Monitor could throw 185,000 cubic feet of water in an hour with a velocity of 150 feet per second. Other accounts of the force are less technical but just as startling. One description points out that a strong man could not swing a crowbar through a six-inch Monitor stream, yet another commented on the striking phenomenon of a fifty-pound boulder riding the crest of a jet with the power of a cannonball. Documented evidence recalls that men were killed by the force of the water from 200 feet away. The Monitors operated twenty-fours a day with the mines illuminated by high-intensity lighting or locomotive headlights. The amount of water needed was enormous. At the North Bloomfield mine, sixty million gallons of water was used daily. Thomas Bell, the president of the company, estimated in 1876 that the hydraulic mine would consume 16 billion gallons of water in that year alone. The debris created was equally colossal. North Bloomfield, a mine about 1 1/8 mile long and 350 - 550 feet deep excavated 41 million cubic yards of material between 1866 and 1884. In 1891, a group of government engineers estimated that hydraulic mining had deposited 210,746,100 cubic yards of debris along the basins of three rivers alone -- the Yuba, American, and Bear. Tornado, flood, earthquake and volcano combined could hardly make greater havoc, spread wider ruin and wreck, than are to be seen everywhere in the track of the larger gold-washing operations. None of the interior streams of California, though naturally pure as crystal, escape the change to a thick yellow mud from this cause, early in their progress from the hills. The Sacramento River is worse than the Missouri. Many of the streams are turned out of their original channels, either directly for mining purposes, or in consequence of the great masses of soil and gravel that come down from the gold-washing above. Thousands of acres of fine land along their banks are ruined forever by the deposits of this character. A farmer may have his whole estate turned into a barren waste by a flood of sand and gravel from some hydraulic mining up stream; more, if a fine orchard or garden stands in the way of the working of a rich gulch or bank, orchard or garden must go. Then the torn-out, dug- out, washed to pieces and then washed over side-hills, masses that have been or are being subjected to the hydraulics of the miners, are the very devil's chaos indeed. The country is full of them among the mining districts of the Sierra Nevada, and they are truly a terrible blot upon the face of Nature. Wherever there was enough water to float them, big dredger boats could be used to work deep gold-bearing gravels. Huge buckets would dig up material as much as 100 feet below the water level and dump it into the processing plant. The gravel was then screened, oscillated, and washed to separate rock from gold and sand. The heavy material was placed into barrels where mercury-covered copper plates trapped the gold. The waste rock was dumped out the rear of the dredger into huge piles called tailings. Today the most visible evidence of dredging debris can be observed surrounding the city of Folsom on the American River. Dredging was most popular and profitable at the turn of the 20th century. It was underground, hard-rock mining operations that transformed California gold mining into a corporate activity. It was in the Northern Mines, clustered around Grass Valley, which dominated underground mining. In the beginning, the gold-bearing quartz was wrenched from underground veins by backbreaking, dimly lit sweat and blood. However, imported miners from Cornwall and Wales adapted ancient European mining techniques and brought modern technology to the enterprise. The miners followed the veins and blasted the gold from the quartz. The mineshafts and drifts were then “mucked out” and the gold-bearing ore was transported to the surface for processing. To access the gold, the ore had to be crushed. The first crushing equipment was the Mexican arrastra, a device that ground the ore between two stone slabs rotated by a mule or humans. The most effective and productive crusher was the vertical stamp mill. The hammers of these big stamps were lifted by machinery and through gravity pounded the ore into more usable material. Separating the gold from the crushed ore proved to be a problem. Due to contaminants, older methods were ineffective. A technique using chlorine gas was adequate but not satisfactory. Eventually a process called cyanidation was commonly used. It was based on the chemical attraction of gold to sodium cyanide. The process would result in a “sponge” of gold and cyanide. The “sponge” would then be further refined to produce pure gold bullion.